George Graham Reviews Robben Ford's Keep On Running"
The blues and jazz have always been related. A lot of jazz grew out of the blues, and jazz musicians frequently use the blues as a jumping off point for improvisation. But in the current context, they have grown to represent two rather different approaches. Both feature generous amounts of instrumental improvisation, but jazz tends to emphasize musical and harmonic sophistication, and the blues derives its power from its relative musical simplicity. And with regard to guitar technique, the blues and jazz represent rather different paths. Jazz generally features a mellow, soft, undistorted electric guitar tone, while the blues, in the Chicago electric tradition, involves turning it up and taking advantage of distortion effects. This also leads to different playing techniques, so there are not too many guitarists who specialize in both the blues and jazz. 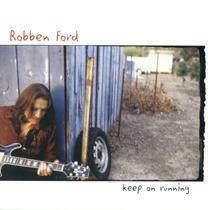 But this week, we have a good example of someone who has been doing that for most of his more than two-decade career, Robben Ford, whose new CD is called Keep on Running. Robben Ford grew up on the blues and soul music of the 1960s, and began playing in a blues group with his father and brother. While still in his teens, he joined the band of blues great Jimmy Witherspoon. But he was also drawn to jazz and the emerging fusion scene. He was a part of the LA Express, who backed Joni Mitchell on two LPs in the 1970s, and also served tenure in Miles Davis' band in the 1980s. At about the same time, he was involved in the founding of the popular fusion group Yellowjackets. In fact Ford's first solo album in the early 1980s was essentially the first Yellowjackets album. But Ford moved on to other projects while the Yellowjackets continues sans guitar. In the late 1980s, Ford decided to return to his musical roots and began a series of blues-oriented albums that continue to this day. But, like another guitarist who moves between jazz-fusion and the blues, Scott Henderson, Ford has brought a degree of harmonic sophistication and the kind of technical ability on the instrument more typical of jazz, into his electric blues context. Each of his blues recordings has had some of that jazziness to it. Keep on Running, though, is probably Ford's least jazzy album, while he emphasizes both the blues and Memphis and Muscle Shoals soul. He pays tribute to the great rhythm sections of the two Southern recording meccas in the 1960s, as well drawing inspiration from some of the British blues of the same period, covering songs by the Spencer Davis Group and Cream. He includes some material from the period, but also includes a fair amount of original music in that style. He is joined by some notable backing musicians, including British blues patriarch John Mayall on harmonica, Ivan Neville of the Neville Brothers on some backing vocals and keyboards, and Edgar Winter on sax. Ford's regular band includes bassist Jimmy Earl, and drummers Toss Panos and Steve Potts alternating. Bob Malach, from the jazz world, is also frequently featured on sax. Ford has a high clear tenor voice that would seem an unlikely match for the blues, but fortunately he does not try to be something he is not, and as on his previous blues recordings, pulls off the vocals well, in an appealing way. But his guitar work is his focus, and he delivers, with good tasteful blues-styled solos, that can build all the energy level for which the music is known. While he does manage to throw in some occasional harmonic twists that one would expect from any jazz musician worth his licks, he does that noticeably less frequently on this CD than on previous recordings. Ford says that he looked upon this release as more of a nostalgic tribute album than one out to be innovative. Guitarist Robben Ford, who came to fame as a jazz-rock fusion player, continues his exploration of the blues on his satisfying new CD Keep On Running. Meant as a tribute album to previous blues and soul styles, from Memphis, Muscle Shoals and even the 1960s British Blues scene, Ford is probably at his his most restrained in keeping his versatile playing focussed on the styles at hand, rather than incorporating his jazz-fusion influence, which he has done on most previous releases. The CD still does provide a nice mix of musical ingredients with Ford's always impeccable guitar work, and his appealing vocals being supplemented by some first rate collaborators. Our grade for sound quality is close to an "A." Ford has been a denizen of the studio for a long time, and his recordings usually reflect his skill and experience with a clean sound with very good mixing work. This CD continues that tradition, though one track is pushed to the point of distorted vocals, which definitely earns a demerit in my book. The dynamic range is not too bad for this kind of music. The blues is a timeless style that will be around long after the current commercial top 40 acts are forgotten. Robben Ford again explores various facets of this great American music form, and creates another worthwhile CD marked by first-class musicianship and a sense of the music's history.